Salsa is the Mexican word for “sauce”. Most of my summer salsas are actually “salsa cruda”, as they are uncooked. I deviate occasionally by grilling fruit, though the salsa would be delicious if the fruit you use is simply washed. All you need to make a salsa cruda are chopped, in-season fruits and/or vegetables, something acidic (lime juice), something spicy (cumin), and something hot (any variety of hot pepper, cayenne or hot sauce). These easy combos will add flavor, nutrition, and eye-appeal to your plate. Peaches are especially easy to grill. Nothing beats this fresh, sweet and tart salsa when peaches are at their ripest. A grilled peach would also make a wonderful dessert with a scoop of sorbet or ice-cream on top! Get a bunch cause they’re on sale at Buschs for $.99#. I served this with my Corn & Barley salad, the August 2nd dinnerFeed. 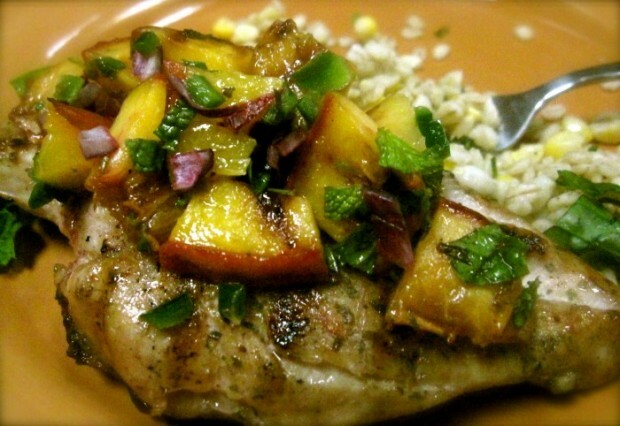 For another easy Grilled Chicken and Plum Salsa recipe see my August 4th dinnerFeed. Combine sugar, salt, coriander or cumin and cayenne and rub into both sides of chicken. Prepare gas or charcoal grill to medium heat. Grill chicken for 13 to 16 minutes or until chicken is no longer pink (170˚), turning once. 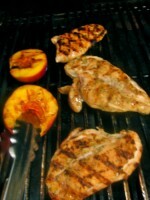 Grill peaches next to the chicken until just tender, about 6-8 minutes. While chicken is grilling, combine mint, onion, 1 teaspoon of lime juice, 1 teaspoon brown sugar and chopped jalapeno. Taste and add additional sugar and lime juice if desired. Add kosher salt to taste. I had a dinner party last night and needed some special way to make chicken…..made this and everyone wanted the recipe. It was really fabulous…Thank you so much!! yo#78u21&;re in point of fact a just right webmaster. The web site loading velocity is amazing. It seems that you are doing any distinctive trick. Also, The contents are masterpiece. you’ve done a fantastic task in this subject!